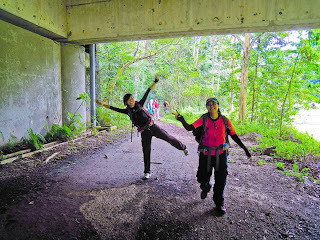 Our NYAA Journey: Day to Night Hike. Please water-proof all your belonging and you must have minimum 12kg load before start of the hike. • Please be on time and we will wait 15mins for the late-comers. • Warm-up before we start the hike. • To have Buddy system. The strong & fit boaters to be at the back of the line. • Please inform the facilitator if you need to leave the group. • Keep within sighting distance of each other. Pls shout 'a-o-nah' if you can't see the pp inform or behind you. • Look out for one another. • Look out for cyclist. • Keep to the left side of the cycling trail and walk in single row. • Trail ourtesy at all times. 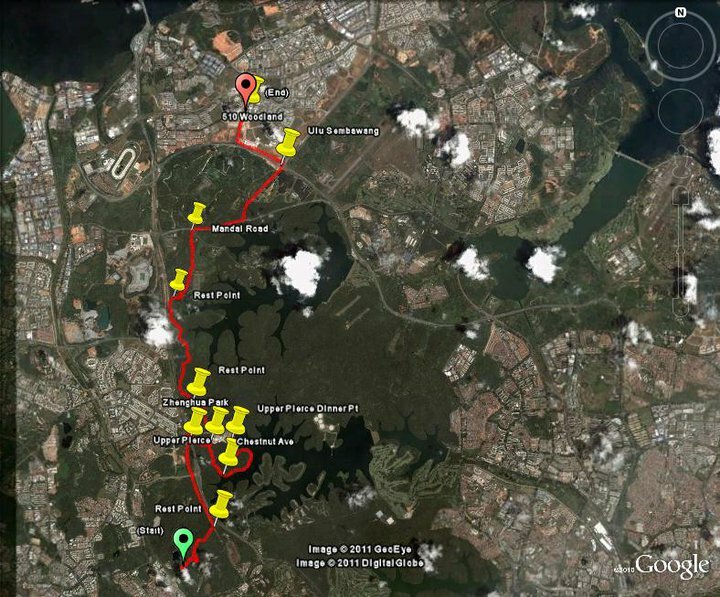 for our day to night hike, we walked from Bukit Timah Nature Reserve's visitor's centre, till woodlands, blk 510.
according to a fellow BOATer, this is currently Singapore's longest hiking trail. 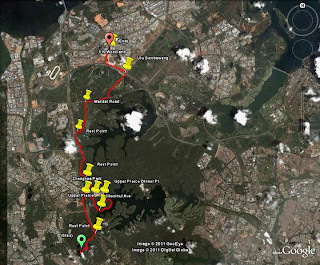 from Bukit Timah, we went via Chestnut drive, till Upper Pierce Reservoir, down to Mandai, all the way to Woodlands, pass the Singapore Sports School. we stopped at Upper Pierce Reservoir to enjoy our well deserved running dinner, and to catch the beautiful sunset. although the real highlight of the day/night would be after crossing Chestnut drive. to liven up the atmosphere, a few of us starting singing random songs such as Black Eyed Peas' I Gotta Feeling. we ended up singing at the top of our lungs from there till the Singapore Sports School. after the trek, most of us further walked to Woodgrove for a nice supper together. from Woodgrove, i walked home. reaching home, my legs gave way, and i think i may have pulled a muscle on my left calf. i am walking funny with a limp, and someone said i look like a duck now. the hike was absolutely enjoyable, and i hope to be back at it again soon.